Wirelessly upload photos to your computer with the Eye-Fi Home Wireless SD card. It's as easy as turning on your camera. No cables, cradles, or hassles. 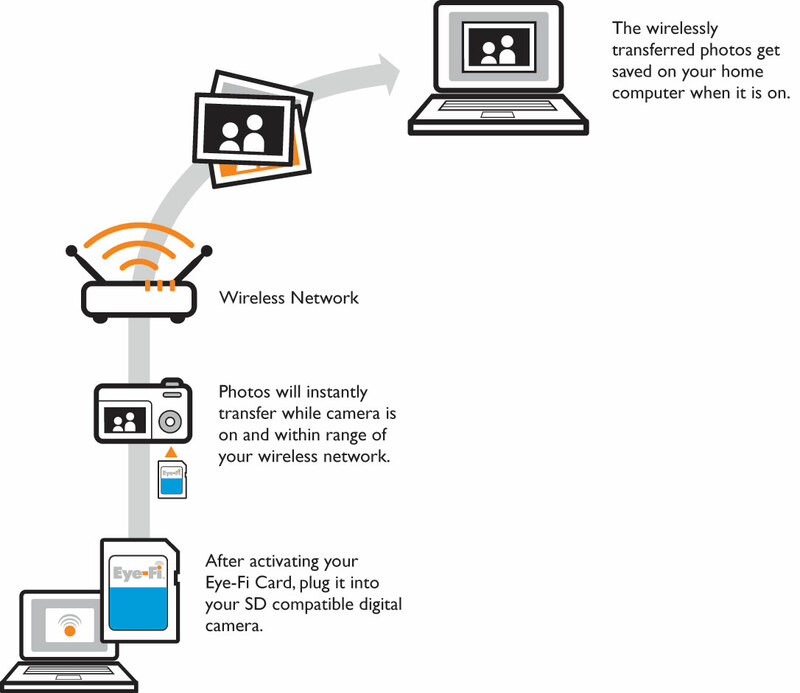 The Eye-Fi Home wirelessly connects to your home Wi-Fi network and uploads your pictures automatically. When your computer is turned on, the Card delivers your pictures to the assigned folder on your computer or directly into iPhoto. A Wireless Memory Card? Yes, there really is Wi-Fi inside that tiny little card. It's going to change the way you take, save and share photos. It makes your camera a Wi-Fi camera. Upload your photos automatically. Photos shouldn't be trapped in your camera. Set them free effortlessly and wirelessly. The Eye-Fi Card is a wireless SD memory card for your digital camera. It stores pictures like a standard SD memory card, but also uses your Wi-Fi network to automatically upload http://images.amazon.com/images/G/01/electronics/detail-page from inside your camera to your PC or Mac. No cables, no cradles, no fuss. It also neatly organizes your photo uploads by date in the folder you choose. Good idea - if it works for you. Cool and Clever Product...Ignore the Nay-sayers! For starters, I researched the heck out of this thing before I bought it. The average ratings made me a little leery of trying it out, but the concept seemed interesting and great enough that I couldn't help it, so I bought one to use with my Canon SD1100 IS. Easy setup. No more wires for uploading pics. Works with practically any photo service (I post my pics to Facebook in near-realtime). Great fun, and it's surprising how much more likely I am to use the camera knowing that I really don't have to plug it in and upload the pics. I just turn it on when I get home, and a few minutes later, I edit the album details online. Speed is fine. You're really only limited by your upload speed of your ISP. I have FIOS, so it's pretty darn fast. Mostly what other people have already noted. You can't upload video. This is not the huge problem you'd think it is. You basically wind up plugging in the camera when get home after you took video. Not exactly like you're losing anything, you had to do that before anyway. The pictures are downloaded from the Eye-Fi service to a folder you specify, but within that folder they're created with the date in the following format: "October 22nd, 2008" which means folders don't sort right unless you sort by folder create date or modified date. That's kind of a pain. I purchased this card for my d40 half years ago, not it sits in my d90. It works really well with D90 because D90 has a menu for this card, I can turn the wireless on and off. Also I don't need to change the monitor off timer as what I did in D40. It's very convenient and easy to install or use. I highly recommand it if you only take jpg pictures. I would not recommand it if you take raw pictures, mostly because it's write speed is too slow compare to other shdc card. Also 2gb is not big enough, it can only save around 150 pictures if I choose raw+basic jpeg in my nikon D90, and it took a couple seconds to finish writing for each of my raw picture. This is a really cool product, the setup is very easy and it does what it supposed to do: automatically send pictures from your camera to your PC as you take them. For example, you snap a photo, about 4 seconds later it appears on your PC in a folder. No more, connecting the cammera via cable, no more popping out the SD card and inserting it into your card reader. There are a few drawbacks: it seems to slow down the camera a little bit, i dont have any hard evidence, just my opinion. Other negative, it will not transfer video files from the camera, those still have to be transferred the old way, its kind of annoying. Cool idea. Not sure if it's ready for prime time, especially for my target application: the non-tech-savvy, poor-fine-dexterity in-laws. The one really big gotcha: it copies the photos, but does not delete them from the card after copying them. So what do you do when your card fills up? You could plug the card or camera into a computer and delete pictures, but wasn't the point to avoid that? You could wipe the card using the camera's UI, but are you sure you've copied all of the pictures? (Besides, what if the reason you're doing it is that you've run out of space, and are away from home so you can't copy those last few pictures?) My whole goal is to make the copy process be almost invisible, so that you just don't have to mess around with it... fail. Range seems quite limited. Connection was iffy from my desk, perhaps 20 feet and a couple of walls from the router. (My PDA connects fine from here.) Since there's no UI on the camera, there's no way to tell that it's trying and failing to connect. As others have said: The requirement for an Internet connection even for local copy is odd. Not a problem for me, but odd. Not copying videos: Bad. Because the camera doesn't know what's going on, it might power off during the copy. They have you "optimize" its power settings by disabling automatic shutdown. It's definitely not going to the in-laws. Not sure if I'll keep it for myself. I have both the Home and an older model equivalent to the Share. Both work as advertised and make life easier. Unfortunately, they don't seem to upload any video clips stored on the card, and you do have to remember to delete the images that have been uploaded. TOTAL CARD FAILURE !!! PICTURES LOST !! I bought this card for my wife because she hates the whole downloading process. I set the card up in her camera (Cannon) and downloaded a few pictures to our computer. It worked. We went to Xmas eve and took about 30 pictures and then the card failed. The card is not recognized by either of our cameras or on either of our computers. The card is basically dead. I'm guessing all the pictures are lost. If you go to the Eye-Fi forum you will see that this same thing has happened to dozens of people in just the last few days. The card works for a few pictures and then dies. It's not just this "Home" card but all the Eye-fi cards that are affected. Eye-Fi has a serious quality control problem. I'm not sure that I'll be able to use these products again. Pictures are all about special occasions - the memory card needs to be rock solid - utterly dependable and these products are not. Rather than store all this information on the card, it is uploaded to eye-fi, who I would not expect to be able to keep secure in view of their idiocy above. Poor design. Rather than being able to upload direct to webdav or similar it needs a program running permanently on your computer. Useless software. You are unable to store settings in advance. I know the essid of my local coffee shop but I have to own a laptop to take it there to store the settings, I cannot upload them in advance to the card, even though I know all the settings. works and does what it says it will do and does it pretty fast. NOTE: if you have AVG Free Antivirus as i did, you wont be able to upload your pictures wirelessly until you disable or remove your anti-virus.